Snowkit-FogClan wrote: "Sorrelstripe, Sorrelstripe, Sorrelstripe!" cheered Snowkit from her seat outside the nursery. Lilywing wrote: Lilywing purred and licked at the three tiny kits at her side as they mewled and squealed for milk. As she touched her nose to each kit, she sent a silent thanks to StarClan for a healthy litter. Deadfur wrote: Deadfur padded into the FogClan camp, carrying a rabbit in his jaws. He made his way into the nursery, dropping the rabbit at the queen's paws with a dip of his head. Adderwhisker wrote: Adderwhisker padded past her clanmates and into the nursery, squeezing inside carefully. Once inside, she dipped her head to the other queens and settled down into an empty nest. Sootwhisker wrote: Sootwhisker padded into the FogClan camp, carrying a mouse in his jaws. He made his way over to the fresh-kill pile, dropping the mouse on top. Adderwhisker wrote: Adderwhisker purred and licked at the six tiny kits at her side as they mewled and squealed for milk. As she touched her nose to each kit, she sent a silent thanks to StarClan for a healthy litter. Sootwhisker wrote: Sootwhisker pulled a fish from the fresh-kill pile and carried it over to the medicine den. Froststep pricked up her ears and padded out of medicine den to hear what Bluestar had to say. "We gather today to welcome five kits into their lives as apprentices." continued Bluestar once the clan had gathered. "Coalkit, you will be known as Coalpaw. Thymepelt, you will be mentor to Coalpaw. Onionkit, you will be known as Onionpaw. Voleprickle, you will be mentor to Onionpaw. Smokekit, you will be known as Smokepaw. Nightcloud, you will be mentor to Smokepaw. Sandkit, you will be known as Sandpaw. Nightfur, you will be mentor to Sandpaw. Snowkit, you will be known as Snowpaw. Rainlily, you will be mentor to Snowpaw." Coalpaw flicked his ears, then padded over to Thymepelt. Onionpaw let out a loud yowl of happiness and bounced over to Voleprickle. Sandpaw snorted quietly to herself, then padded over to Nightfur. Smokepaw quietly padded over to Nightcloud. Snowpaw blinked a few times and padded over to Rainlily. "Let's go check out the territory." meowed Nightcloud as he touched noses with Smokepaw. "Ready to learn how to fight?" meowed Nightfur as he touched noses with Sandpaw. "Let's go work on some hunting skill." meowed Rainlily as she touched noses with Snowpaw. "Mind if we come with you?" Thymepelt meowed to Nightcloud. "Go get to know your new denmates." meowed Voleprickle as she touched noses with Onionpaw. "Coalpaw, Onionpaw, Smokepaw, Sandpaw, Snowpaw!" cheered Snailpoppy for the clan's newest apprentices. Starlingcloud padded into the FogClan camp, carrying moss in his jaws. He made his way into the warrior's den, placing the moss down and pressing it into his nest with his paws. Froststep padded into the FogClan camp, carrying borage in her jaws. She made her way into the den she shared with Freezepaw, placing the borage down. "I, Bluestar, Leader of FogClan, call upon my warrior ancestors to look down on these apprentices. They have trained hard to understand the ways of your noble code, and I commend them to you as warriors in their turn. Graypaw, Cinderpaw, do you promise to uphold the warrior code and protect and defend this Clan, even at the cost of your life?" "Then by StarClan, I give you both your warrior names." continued Bluestar. "Graypaw, you will be known as Grayfircone. Cinderpaw, you will be known as Cindershadow. 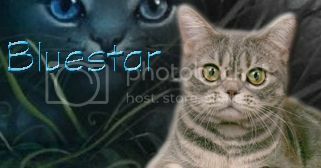 StarClan honors you both and we welcome you as full warriors of FogClan." Cindershadow sat up proudly as the clan called out their new names. Grayfircone gave a little snort to himself, then listened to the clan call out their new names. "Grayfircone, Cindershadow! Grayfircone, Cindershadow!" cheered Onionpaw for her former denmates.